Best laid plans of mice and men.. Yeah, not sure what thats from or who said it but it's pretty much true at times..I don't know if you're like me but there are times when I know exactly what Im going to do on any given day and I dive right in. The problem with that sometimes is, whatever I am working on can become a monster project that I didn't plan on and that, is what happened yesterday.. I "was" going to just straighten up my home because Deanna, the girl who comes to clean will be here this morning and I don't like to have a lot of stuff laying around so she doesn't have to deal with it while trying to clean. Then I was going to work on some paperwork that I seriously need to deal with. I've been feeling so tired lately because I've been constanly on the move and my body is rebelling.. If you read my posts on Wednesday and Thursday of this week I told you and showed you my thrift store finds an my trip to Ollies Outlet. I couldn't wait to dive into my goodies and thats what I began my day with. Mr. Lou was very helpful to me today which gave me some time to finally do something I enjoy. I thought to myself, "oh, I'll just wash everything up so it's all clean when I want to use it".. yeah...OKAY!.. I did wash everything up and the next thing I knew I was decorating and rearranging. Three hours later I was finally done and so were my legs and feet but here is what I manged to accomplish. Remember the pretty pitcher I bought at the Thrift store? Here she is in all her glory on my dining room table. Next I moved onto the glass jars that I got at Ollies. My husband also surprised me with an early Valentines day gift. Yes I know it's an appliance but I'm kind of an old fashion girl. I like appliances, especially when it's what I've wanted and could really use.. I guess Im just practical at times. So between the new toaster oven / broiler and the new jars, I rearranged my entire kitchen almost. 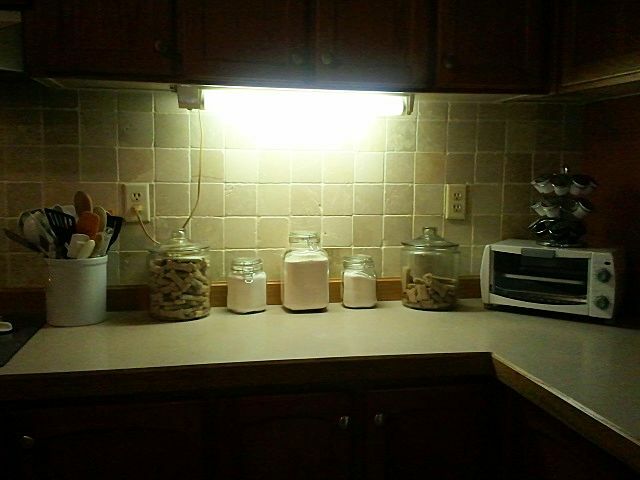 I didn't take many photos but here is my kitchen counter all redone..
And no, I never did get to the paper work. I did however straighten up the entire house after I took my nap. Yep, the exhaustion is palpable but it's all done. I will however get to that paperwork today because today, I am doing nothing that I don't have to.. I hope you have a very happy and blessed weekend! Your pitcher looks perfect now! I do the same thing...start decorating when i get thrift finds. I like to wash things up and do extra, too. I'm glad you know when you need to rest. Take care of yourself and enjoy your weekend! Sometimes days are like that, but it sounds like you had fun rearranging and decorating. 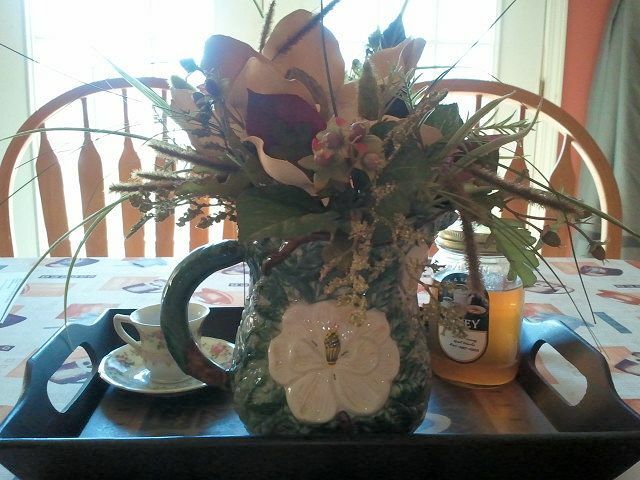 Your pitcher looks lovely all decked out with her new flowers. This is so funny--I did some similar stuff this week--something must be in the air here. My hubby was away for work--for a few days, and when the cat's away the mice will play (just getting into your mice analogies). I moved furniture , re-arranged the kitchen and dining areas, and bedroom and got rid of our bed frame and headboard. It took my hubby 24 hours to realize it was gone and that our bed was just on the floor! ha!! I was tired of the old frame banging and creeking around. The mattress is thick so it still is high enough (perhaps I really am a hippy, lol).